Local burger joint opening in Tucker. 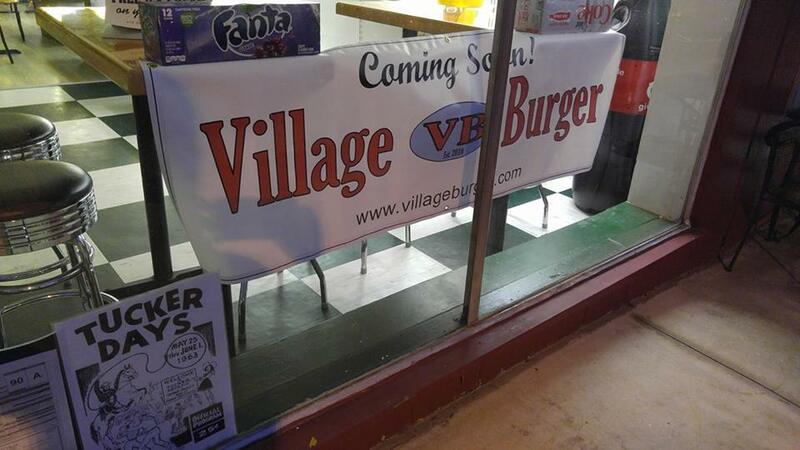 Village Burger plans to open a new location in Tucker later this summer. The restaurant, which replaces The Tucker Fountain on Main Street in downtown Tucker, will be the third location for the local restaurant. The original Village Burger opened in place of a former Bruster's in Dunwoody in 2010. A second Village Burger opened in Johns Creek during the summer of 2014 in a former Yoforia. The Tucker Fountain, which had been a popular Main Street eatery since 2005, closed last month and has since reopened on Lilburn/Stone Mountain Road inside the Smokerise Shell station. The Tucker Fountain space has a long history in the community having been previously occupied by Fountain Drugs and Tucker Coffee Club in the 1960s. Mike Holcomb, an Atlanta native and owner of The Tucker Fountain, made some upgrades to the space but was somewhat limited in what he as a single operator could financially handle. The owners of Village Burger will reportedly invest heavily in the space with plans to renovate the building itself in addition to the dining area and a completely new kitchen. The Fountain featured a menu of assorted burgers, Sabrett hot dogs, BBQ and Mayfield ice cream. Village Burger is somewhat similar. Village Burger's menu focuses largely on assorted burgers (including turkey & veggie) along with chicken sandwiches and tenders, salads, frozen custards, beer and wine. Village Burger joins a growing list of Main Street eateries including The Local No. 7 and M572 in addition to mainstay Matthews Cafeteria. Just north of Main Street, on Hugh Howell Road, Chipotle Mexican Grill and Magnolia Room Cafeteria have both opened since the first of the year. North Carolina-based Cook-Out, a wildly popular fast food burger joint, also opened on Hugh Howell Road last year. While parking issues were cited by Holcomb in his decision to close, hopefully Village Burger can find success in the space even if valet parking has not made its way to Tucker the way it has to other OTP cities like Alpharetta. Have you been to Village Burger in either Dunwoody or Johns Creek? Are you excited for the addition of Village Burger to Tucker? What is your favorite burger in town? Good 'get' for Tucker. I predict it'll do well. I sort of hate that Fountain’s closed or more accurately that the Fountain’s name is no longer going to be on that building. I did eat at the recently closed restaurant once and while it wasn’t bad it was definitely nothing special. I sort of look forward to the redevelopment and wonder if the Tucker Historical Society might work with the new owners to celebrate the history of the building. As a Dunwoody resident, I think Tucker will be pleased with Village Burger. It's a good inexpensive family burger joint that provides jobs for the local kids and supports the community. "Just north of Main Street, on Hugh Howell Road, Chipotle Mexican Grill and Magnolia Room Cafeteria have both opened since the first of the year. " Actually they are 'just southeast of Main Street' on Hugh Howell. We drive up to the Dunwoody location all the time, and really enjoy it. I only hope that they manage to keep the great, friendly service at the new location. So many Tucker fast casual restaurants have employees that treat customers like they are begrudgingly doing them a favor. hopefully they will employ local Tucker kids and support the local school teams like they do in Dunwoody. I'd be surprised if they do anything different than that. Actually Chipotle is North East. Magnolia, is as you say, Southeast. Hugh Howell curves around Staples area.